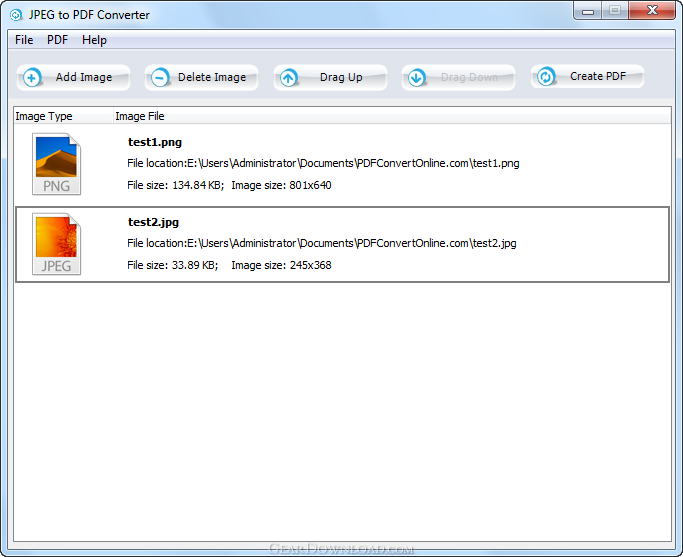 JPEG to PDF Converter - Convert a pack of JPG images to a PDF document. JPEG to PDF Converter is an efficient freeware, which allows you to batch convert a pack of JPG images to a PDF document with a few mouse clicks. The conversion only takes a few seconds to finish. Beside JPEG format, JPEG to PDF Converter also supports many other image formats such as PNG, GIF, BMP, TIFF, TGA, ICO, PCX, JP2, WMF, EMF and CUR etc. Almost all the image formats on the market. JPEG to PDF Converter doesn't require Adobe Acrobat, Adobe Reader or any image viewer software such as ACDSee or Picasa installed. JPEG to PDF Converter doesn't rely on any print driver on your computer to print image to PDF. This download (jpegtopdf.exe) was tested thoroughly and was found 100% clean. Click "Report Spyware" link on the top if you found this software contains any form of malware, including but not limited to: spyware, viruses, trojans and backdoors. Smart Converter CL 1.9.24 - Heavy-duty command line batch image converter. 80+ image formats supported! ReaJPEG - Image converter to JPEG 2 - Image converter to JPEG. It's simple! Tiff Paging 1.7 - Tiff Paging: split, merge, rotate, resize TIFF files. XLS to JPG/TIFF/PNG/EPS converter 4.0 - Convert Excel XLS to Jpeg/Jpg/Tiff/Bmp/Eps/Ps, XLS to Image converter.